This is my GPS; it’s the Garmin 60c. It weighs 6.7 ounces(190 grams) with lithium batteries. I bought it in 2004 for hiking the Continental Divide Trail. Since I have it, I thought it might be fun to bring it on the Pacific Crest Trail(PCT) with me. I was able to get all the topos for the entire trail plus quite a bit of the area around the trail on it. To figure out what maps I needed, I marked all the towns along the way on the program “mapsource” and than just clicked on all the maps that they were in and the ones that connected them. At first I was just kicking around the idea and seeing if all the topos would fit but then I started thinking that it might be useful and fun to bring it along. Last year as I was hiking through the Sierras, I thought, “You know, if a bunch of new snow fell, I would have a really hard time navigating through here.” I don’t want to be a person who follows footprints. Another area where it might come in handy, is if there is a fire, I would be able to see the ways around it. The guide book maps are great when you are on the trail but if you, say, asked me where I was in relation to something outside of the guide book maps, I probably couldn’t tell you. It’s nice to be able to get a big picture of things. It could also give me more freedom and confidence to try different routes. Often I just stick to the PCT because it’s easy to follow and my maps cut off other routes. I’ll just see how it goes. If I decide that it’s not useful, I can put it in my resupply/bounce box and ship it along. Keeping your GPS screen from getting scratched. Posted on May 6, 2008 June 30, 2010 Author crowCategories Adventure gear and techniques, Pacific Crest TrailTags All the topos for the PCT! 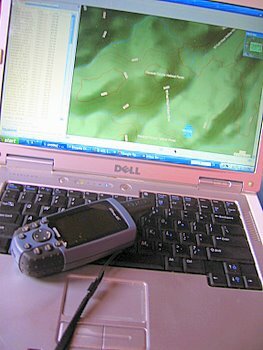 I like your idea of how you’re going to use your GPS on your PCT hike. Be sure to let us know how that goes. What map CD(s) do you need for the trip? It looked like from Garmin they just had topo maps of the national parks.